We recently put out a call to you, our listeners and readers, to ask Vegetarian Zen anything you wanted to know about us. You did not disappoint! 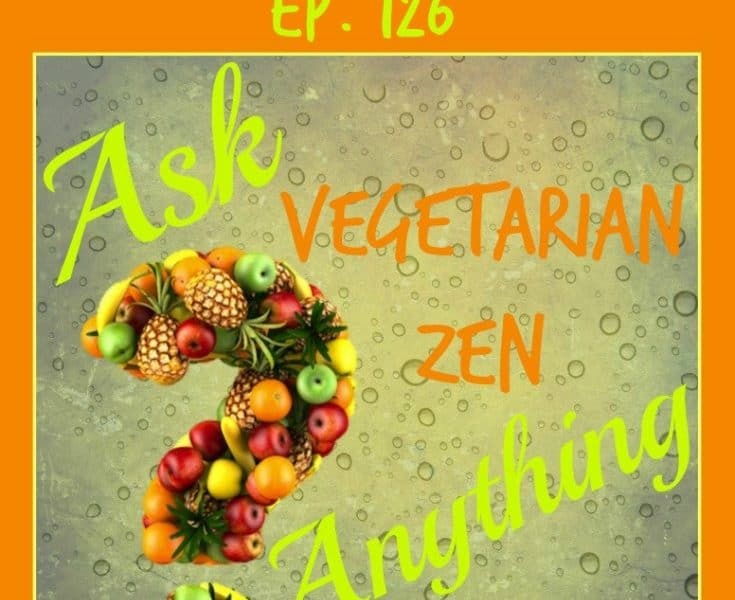 You came up with some really great questions, and in this episode of the Vegetarian Zen podcast, we do our very best to answer them. I found you as I decided to become vegetarian (after watching Vegucated) February of 2013. That year I also was laid off and I started listening to podcasts to help calm my brain before bed. I decided to look up vegetarian podcasts and I found you! I have enjoyed your podcast ever since. Aw, thanks for letting us know, Jen! You are one of the people who we’ve been in touch with the longest, and we do appreciate it! Loved the show today 🙂 I found Vegetarian Zen by chance when searching for “Vegan” podcasts on ITunes to listen to while I was at work. I took the chance and decided to download one of your episodes even though it said “Vegetarian”. It only took that one and I was hooked! After binge listening to about 10 episodes I went online and left you a 5 star rating..If there was a 10 star rating, you ladies would have gotten it!! Love you and keep the podcasts coming.